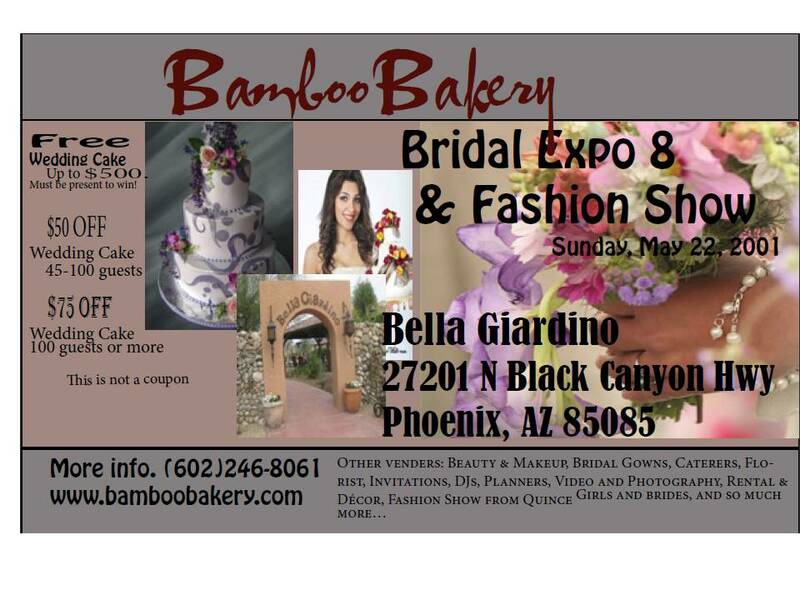 Bamboo Bakery 602-246-8061: Questions and Answer ! Bamboo bakery is here to the rescue, we want everyone to know the answers to questions that you might have or maybe lots have asked. We want to help in any way that we can, so we answered each questions with a few key points that you should keep in mind while ordering a wedding cake. We want your wedding cake ordering experience to be great, and we want to be able to schedule you in and we would be so grateful to be apart of your big day. No wedding with special without that special cake, that memorable flavor and design that is the next center of attention to the bride and groom. The cake is what represent and at the same time celebrate your unity as husband and wife. 1/How far in advance do we have to order a wedding cake? Well usually it depends a lot on the date, we would have to check if your day is available or not. We would suggest maybe 6 months or more in advance, although we do have some last minute ones that we would get into because you don’t want anyone to go without a wedding cake for their special day. Also, we would have to take into consideration about the custom part, if it’s more stylistic we would need more time. So the sooner you call the better. If you order 6 months in advance you would have 10% off, 1 year in advance would be 20% discount, and 3 years it would be half off. 2/Is there a lot of people that order 3 years in advance? There are actually a lot of people that do that, it’s because sometimes it’s not wedding cake that they are looking to order. They may want to order anniversary cakes, sweet 16 cakes, or quinceanera, and or wedding cakes. As for wedding cakes, if you know that you are going to be together forever, why not. Also, if you have a 12 or 13 year old, you know that you are going to be 15 and 16 soon, so why not. Think ahead, it’s save you lots of money, especially if the prices are changing every month. Even if you save lots of money, the cake would have the same great tasting quality. 3/How much cheaper if we were to order in advance? Every month the prices changes, it only changes because we have to take into considerate of the state of the economy. Depending on gas, ingredients, and or etc, the prices would go up or down. Although, we always want great prices for all of our customers, so we take that into consideration too. We have the best prices compared to other bakeries, at the same time our cakes looks great and taste absolutely amazing. Every month the prices do change ingredients and gas. If you were to order 3 years before is way cheaper, and it's 50 percent cheaper depending on monthly price changes. Order as soon as possible, the soon the cheaper. 4/How can I order a cake if my significant other is serving in the military? We support our troops, male and female. We want to show our appreciation for those to serve and risk their lives to fight for our country, so we are willing to work with you in these type of situations. We open a more flexible window for you; you would have to tell us two months before hand, if you were to change the date of the wedding. We would keep everything the same, price and all but push the date back. Also we have special discounts if both to be bride and groom serve in the military, we off 10 percent off. If one serves that would be 5 percent discount for our men or women of the military. 5/Are there special discounts because of our economy? We know are aware of the state of our economy, and we are willing to cut price where ever we can. So if you were to attend one of many bridal/fashion shows we are giving away discounts just for you attending. You would get 75 dollar off your wedding cake if you have more than 100 guests and 50 dollar off your wedding cake, if you were to have less than 100 guests. At these shows you also have a chance to win a 500 dollar free wedding cake, the winners of the wedding cake would have to attend and have to be present at the time we call out your name. We are also giving random discounts on Facebook, so follow us on https://www.facebook.com/BambooBakeryBest and hear about them on there. 6/Where can I check for pictures and prices of cakes that are more original and not custom? You can check on www.bakeryarizona.com , here we have several pictures of wedding cakes that aren’t really custom. So if you already know what you want, just give us a call and we will get you in as soon as possible. 7/Where can we try your cake? Everyone can try our cakes at all the events that we are apart of and the ones that we are hosting. At all these places, we would bring samples of our most popular cakes. You can try all the flavors that you want, and it’s free. So come join us whenever you get the chance. To know the date and time, just check our website, and or pick up a flyer at the bakery. 8/Can I bring my own design? Yes, you can bring in your own design. We actually would love it if you were too, because that would help us sketch out that perfect cake just the way that you imagined it. So don’t ever hesitate of telling us your crazy thoughts and ideas. Also, bring in whatever you can you help us get on the same page as what you want your wedding cake to look like. We have over 20 years of experience design cakes, so we do have the experience and knowledge to make whatever that is that you are picturing a reality. 9/Where can I check out your bakery’s reviews by past brides? You can check wedding wire.com. All the reviews on here are of brides that have used us in the past, they will let you know how great we are. 10/Where do you guys deliver to? We deliver Arizona-wide, although there is a delivering fee, to know about how much it is; you would have to give us the exact address and we would calculate from there. The traveling fee is quite reasonable, so don’t let that stand in your way of asking us to deliver. We do have lots of orders that are nationwide as well, for those orders we ask you to order at least 2 years in advance, because we have lots of places to go all over the US, at the same time all of Arizona. 11/Do you make the flower sugar, icing, and fresh flowers? We do all of these flowers. Fresh flowers is most common, we ask our bride or groom to bring in their flowers. Just so that we would match the right flower and color. As icing, we do make them in the color as you want, so that would be simple. As for the sugar flowers, its takes time to make. So if you were to order a cake with sugar flower, we would advise you to order more in advance because these take lots of time to make. We hope that we have answered all your questions. We tried to answer as best as we can, but at the same time tell you some points that you only benefit you. If you were to have more questions just email us at orders@bamboobakery.com. "Great Wedding Cake ! and Great Service ! " Testimony from our Customer !